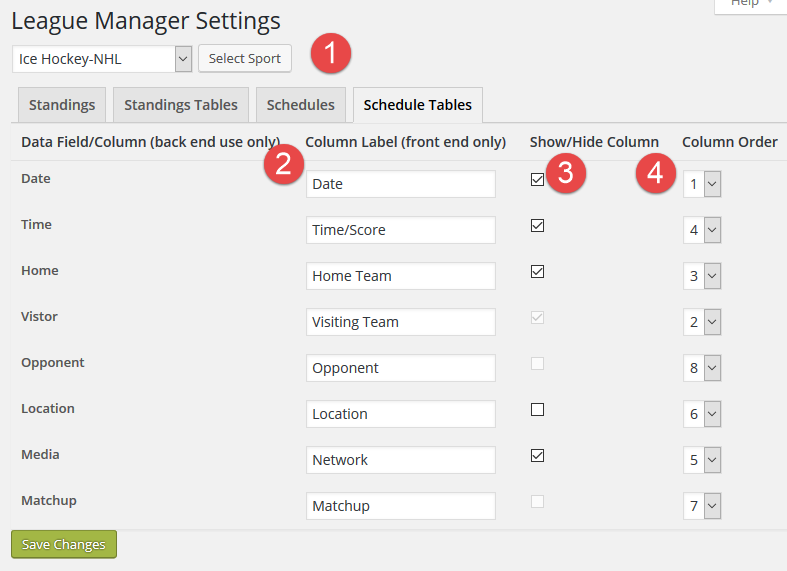 The Settings Schedule Tables tab provides layout options for the league schedules and galleries, and team schedule tables [shortcodes]. The primary data fields and functions are described below, and annotated on the following screenshot. Select Sport. Settings are driven by SPORT, not league, team, or season. All leagues for a given sport will use the same settings. Need another sport? A filter is available to extend both the list of sports. Column Label. Change the column labels. For example, “Location”, “Loc”, “Venue”, “Field”, or “Court”. NOTE that the “Opponent” label is used in place of the “Home” and “Visitor” labels on Team Schedules ONLY. Show/Hide Column. Only columns with this box checked are displayed. Column Order. Set the order in which the data columns are displayed. NOTE: It is suggested, but not required, that you set the columns that are shown in order – 1, 2, 3, … – and set the columns that are hidden all to the highest number (21).